Produced during the LIVE Biennial of Performance Art, the Nova Library was housed at Vancouver Public Library's Central Library (350 West Georgia St.) from October 17 until November 30, 2005. 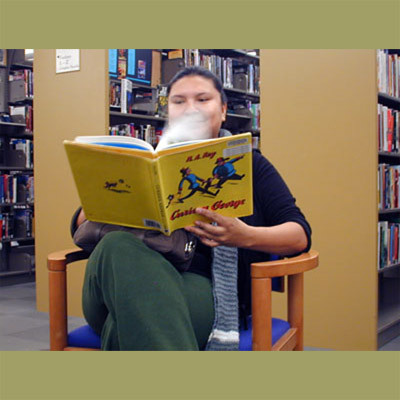 Named after William Burroughs' novel, Nova Express, the Nova Library attempts to share the creative process with the community and represents the spirit, ideas, and creativity of drug users and ex-addicts in the Downtown Eastside. Working with a number of Downtown Eastside organizations to collect title suggestions, artist Hans Winkler has created a 'social sculpture' featuring a display of hundreds of diverse titles representing a range of writers, themes, and ideas (click here to download a 96KB .pdf of the titles). Hans Winkler is a German artist living in Berlin and New York. His work is based on social interactions often in an urban context, which explore the reality of daily life and the perceptions of popular symbols. Libraries and books have been a subject of Winkler's work in the past. Previous installations include a Philosophers Library in a renovated shepherd's shack in the Swiss mountains near the Italian border. More recently, he showed a Massachusetts Cape Islander outfitted with shelves housing telephone books from port cities around the world. These telephone books are permanently installed in the Robert Frost Library in the US. Co-sponsored by the Portland Hotel Society, Vancouver Public Library, Vancouver Area Network of Drug Users (VANDU), and Vancouver Coastal Health, The Nova Library is funded through support from the Vancouver Foundation, The InterArts Office of the Canada Council, and The Arts Presentation Program of Heritage Canada. It is part of an ongoing exchange of exhibitions, artists and ideas between grunt gallery (Vancouver) and Nuova Icona Gallery in Venice, Italy. Hans Winkler (1955) lives and works in Berlin and New York. Until 2000 he worked in collaboration with artist Stefan Micheel under the label "p. t. t. red". His recent exhibitions and projects include: "arche"at Pierogi gallery New York, 2001 and the show "art of the festival" co-curated with Marion Piffer-Damiani in Bressanone, August 2002. His work, in which some elements of irony and destabilization become crucial, is based on interventions often in an urban context. The Actions of Hans Winkler are mostly seen as interventions into the reality of daily life and the perceptions of popular symbols. With p.t.t.red he knocked off the peak of the highest German mountain, the Zugspitze, brought the stone into a Berlin gallery and crushed it in a concrete mixer. In another project in 1996 on a warm New York summer night p.t.t.red covertly changed the illumination spotlights of the Statue of Liberty into beams of bright red light. The links below launch video of the Nova Library opening in a pop-up window. A high-speed connection is required. Last week marked the opening of the Nova Library at the VPL. The Nova is a library within a library, a reading room comprised of books recommended by the drug-addicted community of East Vancouver. 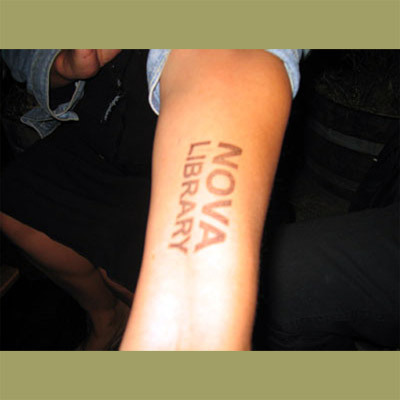 The Nova Library is also a new site-specific project by conceptual artist Hans Winkler. Based alternately out of Berlin and New York, Winkler has been making art within the public sphere for over twenty years. Last weekend, while in New York, Winkler generously participated in a lengthy conversation with the Only over our high-tech VoIP line and revealed some of his motivations and concerns with his recent project in Vancouver. The beginnings of the project go back two years ago when Glen Alteen of the Grunt Gallery invited Hans Winkler to do a project here. Being immediately drawn to the East Side for its contradictory nature, he spent time walking around and speaking to people from VANDU and other organizations. The idea to do a library came from noticing a lot of people in the community liked to read and that junkies spend a lot of time at the public library. So with the help of Glen Alteen and Chris Livingston, Winkler asked a large sampling of the addict community to recommend up to three books to be included in the Nova collection. The collection now comprises an eclectic set of over five hundred books and is collaged together in odd arrangements. For example, one can find the Qur'an next to Ken Kesey. The dominant themes of the collection seem to be the hippy and beat writers, native spirituality, various self-help manuals, and a lot of fantasy and science fiction (running the gamut from Aldous Huxley to Conan books). No one was too surprised, that after all the data was tallied, Hunter S. Thompson walked away with the honour of most popular writer, nudging out some of the other icons of the 60's and 70's like Ginsberg and Burroughs (whose book Nova Express is the text the Library takes its name from). Winkler sees the books as a sort of collage of ideas, bringing together the structures of different worlds. Books and other cultural products function as signs for ideas and ideology and in recent years we have been forming online communities based on lists of favourite music, movies and books, reading into the personalities of strangers based on their preference in cultural products. This cultural logic has also been adapted by a number of artists working in various media. Art made through the sampling and collage of existing cultural works has drawn critical attention and been theorized under the rubric of "Relational Aesthetics" and "Post Production," most notably by the French critic Niccolas Bourriard. In the case of Winkler's Nova Library, he can be said to create an aesthetic through the collage of not only the texts, but also through playing with the structures of the larger communities and institutions involved in the project. The addiction haunting the DTES runs parallel to the addiction that often haunts writers everywhere, and is one of the main structural components of this relational aesthetic engaged by Winkler. In Berlin a lot of the writers are on drugs, he says, and the connection between writing and drug addiction does seem to claim a universality spanning cultures and time. Like Li Po, my favourite ancient Chinese poet, who writes incredibly nuanced accounts of his various drunken states. 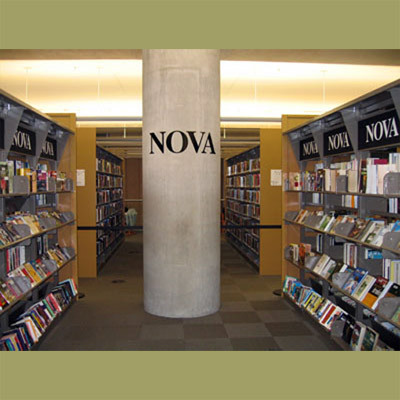 For the next four weeks, the Nova Library can be found on the main level of the VPL in the 'recreational reading area' where it has displaced the Western genre fiction. The Nova Library will be on display during regular library hours on the main floor of the Vancouver Public Library's Central Branch (350 West Georgia Street), until November 30. "Maybe we need to condemn addicted people to make ourselves [feel] better," suggests artist Hans Winkler. Born and raised in the Bavaria region of Germany, Winkler is responsible for the creation of the Nova Library, a collection of books chosen by drug users and ex-addicts of Vancouver's Downtown Eastside. Produced by the Grunt Gallery, this interactive exhibit is a collection of approximately 500 books that "represents the spirit, ideas, and creativity" of that unique population. 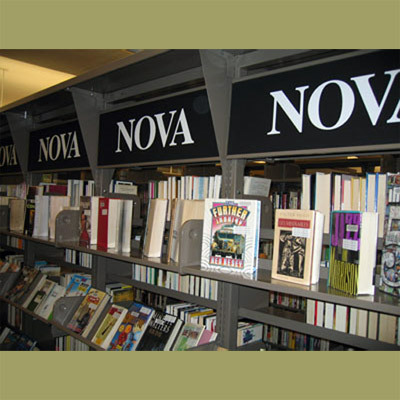 The name Nova Library was inspired by the book Nova Express by William S. Burroughs - renowned author, drug user, and beatnik - just one of the books included in the interesting, and surprising, collection. The project attempts to narrow the gap between "us" and "them." It shows that we are all living beings with minds capable of containing thoughts, and thoughts that may not be so different from each other. Winkler's interactive art has been responsible for bringing many regional social issues to light. Between 1988 and 2000, Winkler and an associate operated under the name P. T. T. Red (Paint The Town Red), creating many pieces in public space. Some of their "social sculptures" include self-producing a newspaper in Istanbul earlier this year with 15 young Turkish artists, focused on walking and working in public space. The paper was intended to open the eyes of the readers to help them discover the aesthetic value of everyday life. In 2002, Winkler created his sinking gondola project in Venice, Italy, that mimicked the reality of the permanently sinking city. Winkler was also responsible for a piece in which red film footage was projected onto the Statue of Liberty. This bathed Lady Liberty in a warm, red glow that lasted until authorities clued in and dismantled the exhibit. "My art is based on site-specific work," Winkler said in an interview. "So I try to intervene into the city - work with their symbols, my impression of the city, and the people - and to involve their ideas into the art piece." So when Winkler was asked two years ago by the curator of the Grunt Gallery, Glen Alteen, to do a Vancouver-based project, he readily accepted. After an extensive scouring of the city on foot, he became very interested in the dichotomy between the city's beautiful surrounding landscape, and the image and surroundings of the Downtown Eastside. Wandering through the area, he often noticed "many drug users sitting and reading." He often discussed the concept of the Nova Library with the people he saw. "They just got the idea immediately and they liked it," Winkler said. "It became a very democratic and public intervention for the public library," he explained. As democratic as it may have begun, when art met bureaucratic institution, things ceased to run as smoothly. Winkler had to downsize his ideas: accept a smaller number of books to be on display, and a smaller space than was anticipated. He explains that he was refused the right and the funds to do construction in the space he initially desired, and was unable to hang banners from the cement roof as he had planned. He was quite reluctant to follow that unbreakable rule of never posting or painting anything on the cement pillars. If he'd hoped that the word "Nova" painted in bold black letters on the central pillar would go unnoticed, it wasn't to be. Despite complications, both parties ended up pleased with the outcome. "It was part of the project," said Winkler. "Two worlds are getting into a conversation, a dialogue . . . and by the end of the process I got a wide, interesting, and beautiful selection." Addicts read books too. This may be the most commendable message that a new exhibit at the Central Branch of the Vancouver public library gets out. Nova Library, a "social sculpture" by New York artist Hans Winkler, is up until Nov. 30. This library-within-a-library is a collection of a few hundred books selected by drug users in the Downtown Eastside, responding to a survey by Winkler. The artist has worked in Europe and North American, carrying out actions and projects that intervene into popular consciousness. This latest project aims at the heart of Vancouver's shameful present: it humanizes the addict. 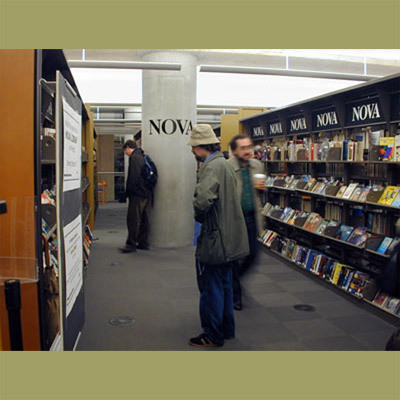 Nova Library is named after William S. Burroughs' 1966 novel Nova Express. Written in Burroughs' cut-up style, the novel fused science fiction with social satire: "Your cities are ovens where South American narcotic plants brought total disposal Brain screams of millions who have controller lives in that place screamed back from white hot blue sky - Can always pull the nova equipped now with tower blasts from Hiroshima and Nagasaki." With the Nova Library we hear those "brain screams" - for we are in the brain of the addict, the junky, the user. 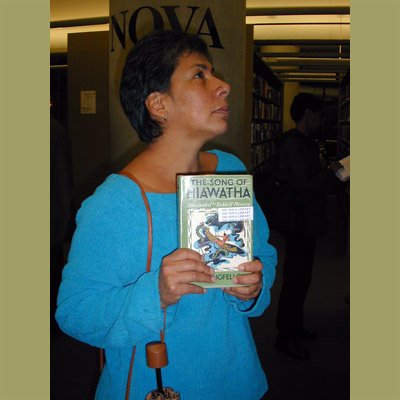 Because what is most striking about this work is the sheer variety of books chosen for inclusion: from first nations literature to self help, from children's books to literary classics, from genre fiction to West Coast classics. So Curious George rubs shoulders with Waiting for Godot; How to Draw Comics the Marvel Way with The High Times Reader, Geronimo's Story of His Own Life with Illegal Drugs: A Complete Guide to Their History, Chemistry, Use arid Abuse. Suddenly all of literature looks to be an allegory for addiction. Just what is George so curious about? And maybe Godot was Samuel Beckett's connection. So this plenitude, this wide range of titles, reference, interest and reading, also does something else. The Nova Library reminds us that we read some of these books - that indeed there is more that is similar in drug users and non-drug users than different. Indeed, with the range of drugs today from chocolate and caffeine to Paxil and Xanax, from pot to coke and sugar to heroin, who among us is not an addict, a junky, a user? This might be the only criticism of the Nova Library. Why only survey drug users in the Downtown Eastside? We know that drug users live everywhere in this city -province - country - but it is the Downtown Eastside that has been demonized as a junky haven, as though users aren't in Kerrisdale or Comox, Richmond or Regina, North Vancouver or North York. Nonetheless, this is an affirmative project, an in-your-face affirmation that, yes, drug users, those pawns in the Drug Wars and the Four Pillars policies, have imaginations, have creative lives, and live in the world of books as much as any of us. For there is another Nova Library: the Carnegie Branch at Main and Hastings where, every morning when it opens, women and men are waiting, anxiously, to enter that world. It is to Hans Winkler's credit, and that of the grunt gallery that sponsored this project, that now we are aware of these connections. Clint Burnham is a Vancouver freelance writer and educator.